USCG licensed captain Donald Stephens aboard "Dream Catcher" a 24 foot Thompson Hardtop . Your vessel pictured above in Conneaut , Ohio Harbor June 2013 . Don't forget to drop by my Adventure blog to see what we're catching . Double click the link below . This is our most popular trip please book early to ensure you have your date reserved . Night Walleye Trips only offered May 15th - June 30th offered in PA waters only . Night trips start at 9 PM fish until 3 AM or limit call for availability . These can be short notice next day . An example of offshore trolling is shown below . One of many Walleye to bite the dust in the 2011 season thus far . We do not fillet perch unless we have adequate time to prepare for the next day . Perch may be taken to a local bait shop and cleaned for a small fee . If we do have time to clean your perch there is an additional fee of .50 per fish . Walleye cleaning is 2.00 per fish . We reserve the right to have other establishments clean your fish . This is due to running multiple trips in a day . AM Perch 6AM-11AM Approx 5 hours or limit $ 450.00 maximum of 6 . 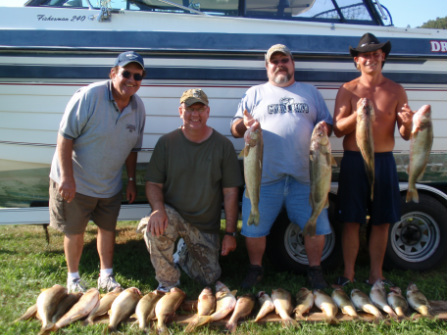 We do not fillet walleye or perch unless we have adequate time to prepare for the next day . Perch may be taken to a local bait shop and cleaned for a small fee or we usually have cleaners available . If we do have time to clean your perch there is an additional fee of .50 per perch and 2.00 per walleye . If you choose to fillet your own this may be done at our facilities for no additional charge. All prices include fishing gear and bait for all anglers . The earlier we start will increase our odds for a daily fish limit. The optimal time to meet at the dock is 6:00 AM please be ready to board our vessel . I will call you the day prior to your scheduled trip to discuss any weather affecting our trip . If you will be unavailable to receive my call please call me ahead of time . A 100.00 deposit is necessary to hold your date and balance of fees are to be settled prior to leaving the dock . A check will be accepted for the deposit ONLY the remaining balance of charter fee must be paid with cash . Balance of daily charter fee is due at dock will be accepted by cash only . I apologize for any inconvenience this may pose. Fishing time is dock to dock . A professional atmosphere and crew ready to go the extra mile for our customers . You are the reason we are here and will be shown an honest day on the water with plenty of humor to keep your interest . Here at A Day Away Fishing Adventures this isn't a job it is our livelihood .... Each adventure takes our hearts , strong morals , and passion for our prey to the water . Come aboard & join our family you will not be disappointed . As you sit back & relax I locate schools of walleye roaming between 20 - 80 feet of water . In early June we may only be fishing a mile off shore as the water warms the fish will be found deeper with action really heating up July - September. The rising water temperature causes a yearly migration of walleye from the shallower Western basin to the deeper water comfort and forage of the Eastern basin . In August we may be as far out as 18 miles offshore in search of these trophy fish . Lake Erie is in my eyes the best walleye fishing in the world with average fish around 5 lbs and fish in the 10-12 lb range not uncommon ! My personal best is currently 12 lbs but I'm hoping that 14 lber will be on your trip ! 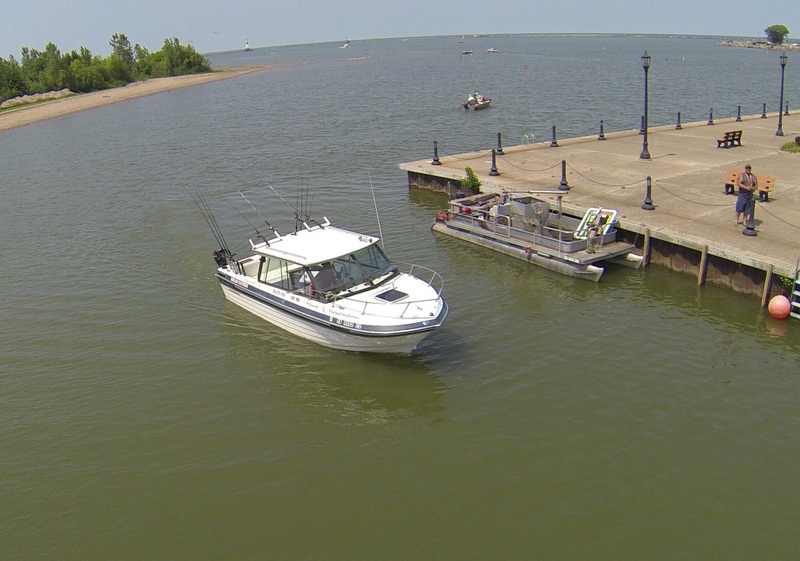 Trolling is the most effective method for consistently bringing eastern basin walleye to the net . Planer boards , down riggers will be the normal set up . Running dipsy divers close to the boat in the 50-70 foot range and jet divers off the board lines to 50 feet and up in the water column . Use of plugs , spoons , and crawler harnesses will be employed in the spread of lines that enable us to run up to 14 rods at one time . As you sit back & relax I locate schools of perch using my electronics . We position ourselves over the fish and drop anchor usually between 30 - 80 feet of water depending on water temperature . 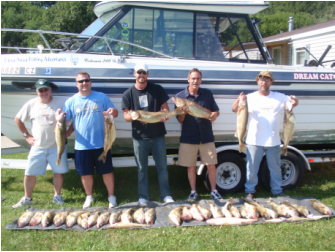 This fishing takes place within 7 miles of the Lake Erie southern shore line . You will be using quality Okuma spinning reels with 8 ball bearings and 6-7 ft graphite rods equipped with 6lb test fireline Crystal that shall detect the lightest nibble from a perch. The rigs will be tipped with Emerald Shiners and dropped just off the bottom of the lake . The pace at catching these tasty critters can be fast & furious. Occasional white bass and sheephead will be caught and are a fun fight along with the perch . Perch average between 8 - 12 inches on Lake Erie with some jumbo Perch to be had over 12 " ! In My Opinion Perch is the best table fare lake Erie has to offer .